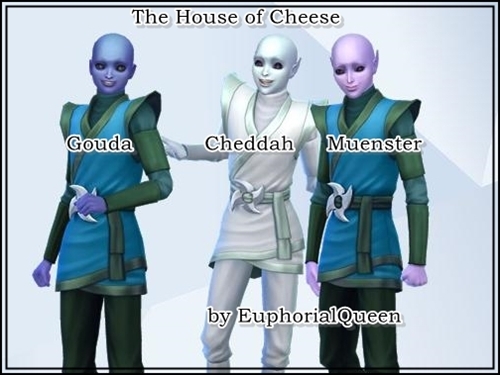 This will be a very informal sharing of the life and times of Cheddah Cheese. 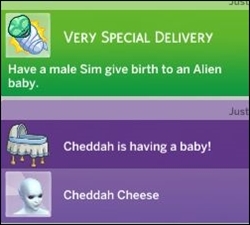 Cheddah is an Alien adopted and raised by a non-alien father. 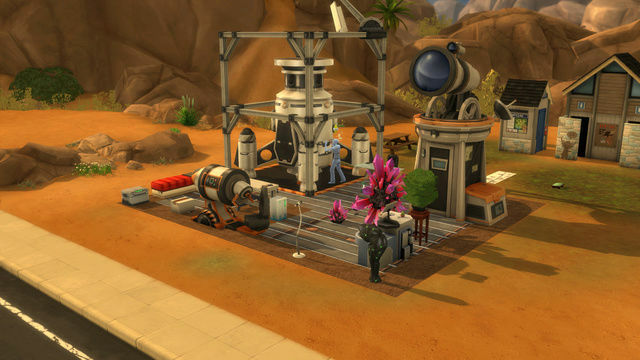 He moved into EQ's Base Camp to continue his scientific research and attempt to find out more about his Alien origins. He loved his foster father, Mac Cheese, very much but knew he needed to connect with more of his people. Settled into his new home he set about collecting odds and ends to examine and catalogue. 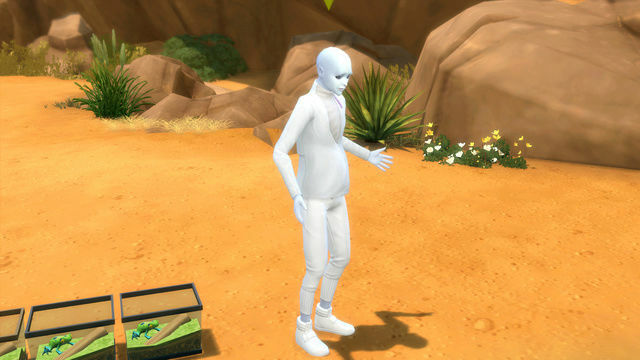 The world is full of Sims not liking the idea of Aliens living among them. Mostly because of fear and a lot of false information about being dissected or turned into some sort of mutants. Fortunately there are still plenty who greet them with open arms and welcome them to share their community. Cheddah made the rounds meeting and greeting everyone while looking for anyone with information about his heritage. Then one night he was taken up into one of the scout ships. 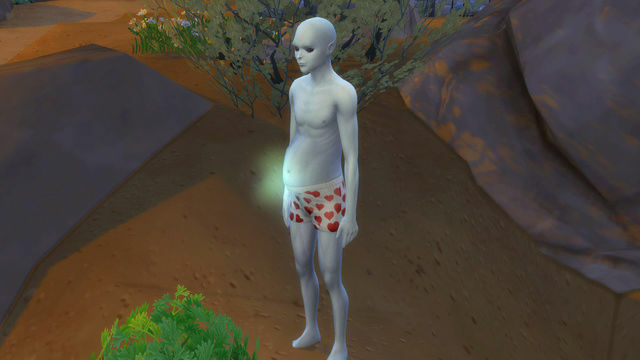 Little did he know this encounter would result in him being pregnant?!?!? No wonder he was queasy and ill these past weeks. This is the place Cheddah chose to explore space and find a way to his original home. He was finally able to finish his ship and met who he thought could have been his birth parents. Sadly this was not so. 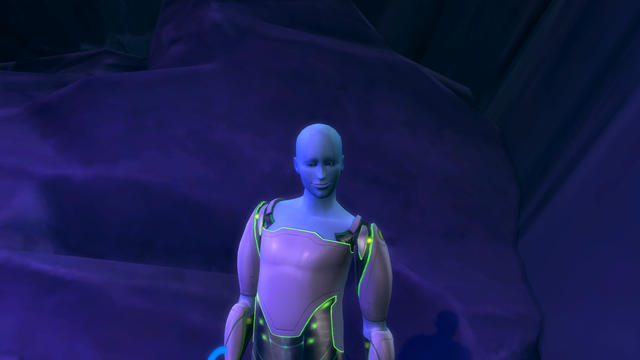 Without warning he was whisked away when he went to investigate some strange lights. What's this??? Maybe he just needs to work out more. What? Doesn't everyone go fishing in their Heart underwear? 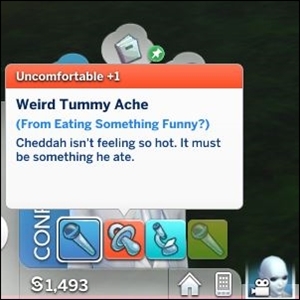 Finally Cheddah discovers the cause of his tummy troubles. Muenster (confused): "Daddy ...? Where you go Daddy?" 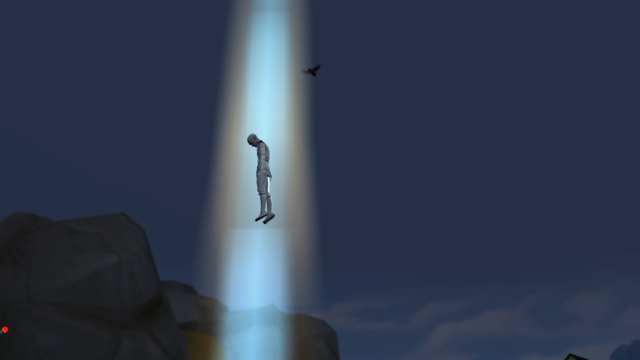 Cheddah (voice fading away): "Don't worry Son .. I'll be right Baaaack..."
Cheddah: Guess what ... you are going to be a big brother soon. Interesting happenings. Love the names. 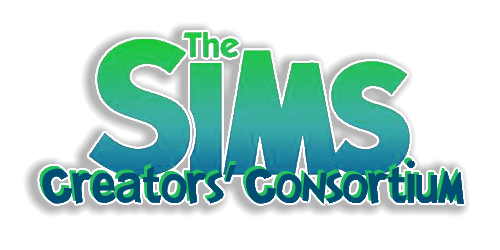 Glad you like the names. 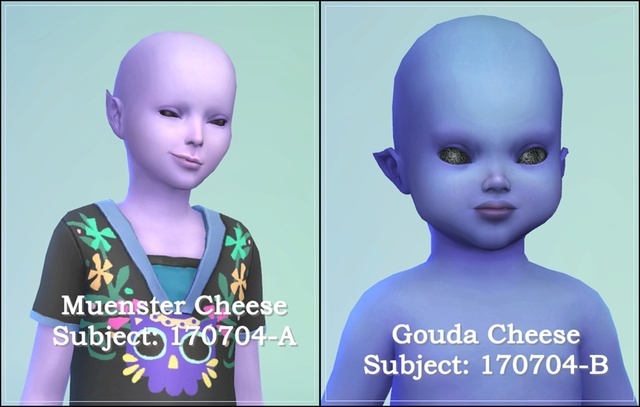 I am hoping to share (remember to take) pictures of Muenster and Gouda as soon as I age Gouda to a toddler. Daddy and Muenster sharing computer time. Awwww. Those are some cuties you got there! Lovely story. 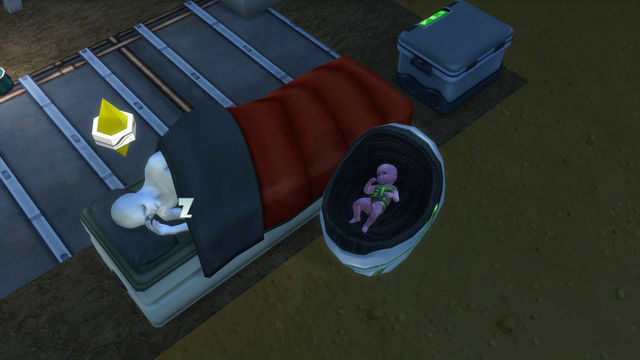 Your little aliens are adorable. 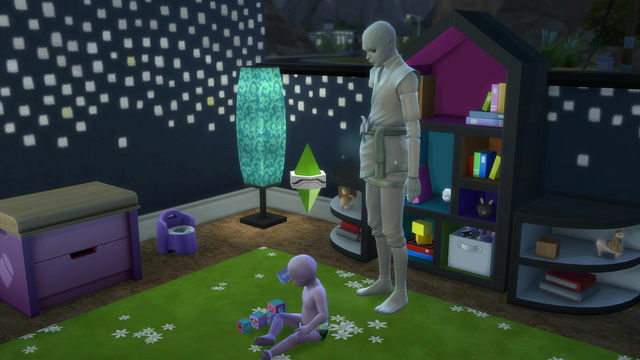 Do you know if the game uses the abducted Sim's features to generate the kids or are they purely accidental? and their picture in the family tree is so small. The only thing I can see is they are different shades skin. He had several Abduction babies and they did strongly resemble him. 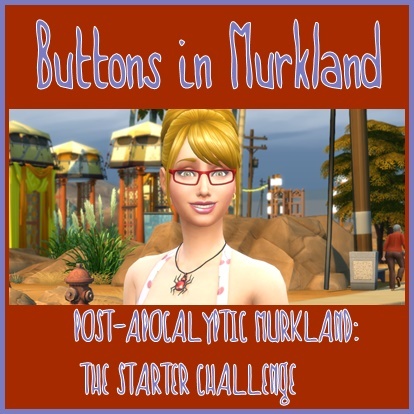 Gouda rolled the Social Butterfly Aspiration and is on the last stage. He needs to be friends with three other children. Muenster has almost completed the Nerd Brain Aspiration and still has a few days til his YA birthday. I am still struggling with a few issues with dropped actions. wander off to do something else. Supposedly it might be related to the "Good Manners" trait. I deleted all the sinks and that particular action no longer interferes. You are doing so well. 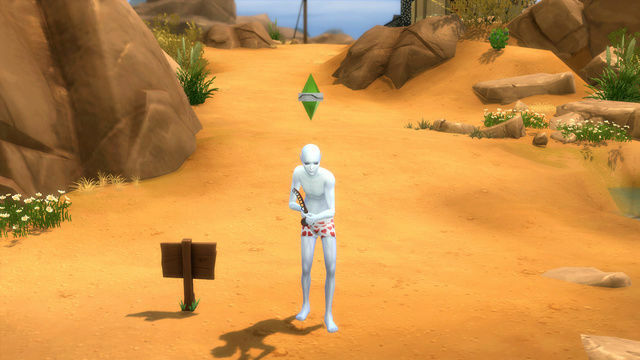 The Aliens are so fun to see! "While angry, Muenster can now Rant Logically to reduce his anger." Muenster is six days from his YA birthday and Completed the Nerd Brain Aspiration. Household shared in the gallery. At this point Gouda has just celebrated his Teen birthday and Muenster is six days from becoming a Young Adult. 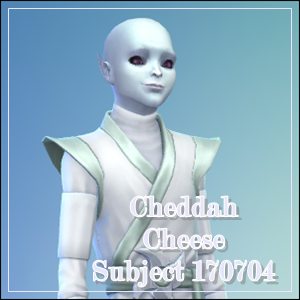 Cheddah still has some time before his Adult birthday. 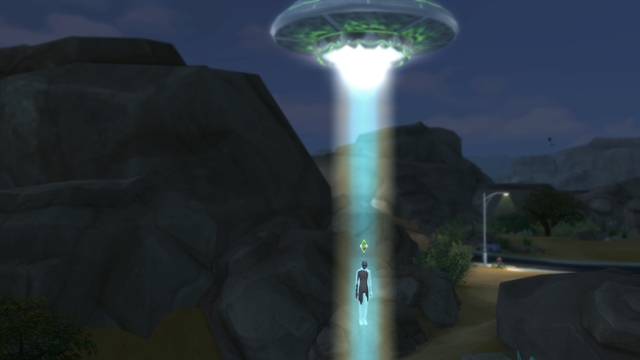 Have Sims be abducted by Aliens 3 times. Just played a short bit today.